It's 26 years since Yugoslavia broke into pieces and the republic of Macedonia came into being. In all that time, the new country has lacked an official, internationally agreed name, because of Greece's objections to the name "Macedonia". And for nearly all of that time, explains Alex Marshall, one man has been working to solve the problem. Matthew Nimetz wants to make something clear - he has not spent every waking moment of the past 23 years thinking about one word: "Macedonia". "I have probably thought about it more than anyone else - including in the country," says the 78-year-old US diplomat. "But I have to disappoint anyone that thinks it's my full-time job." Since 1994, Nimetz has been trying to negotiate an end to arguably the world's strangest international dispute, in which Greece is objecting to Macedonia's name and refusing to let it join either Nato or the EU until it's changed. Greece says the name "Macedonia" suggests that the country has territorial ambitions over Greece's own Macedonia - a province in the north of the country - and is a blatant attempt to lay claim to Greece's national heritage. It should be called something like "Skopje" instead, Greece argues - Skopje being Macedonia's capital city. Macedonia, by contrast, argues that you can trace its people back to the ancient kingdom of Macedon, once ruled by Alexander the Great - and that the name "Macedonia" is therefore the obvious choice. One upshot is that travellers entering northern Greece from the Republic of Macedonia, and those crossing the border in the opposite direction, are both greeted by roadside signs welcoming them to Macedonia. When Nimetz began his work on the dispute he was serving as US President Bill Clinton's special envoy, but since the end of 1999 he's been the personal envoy of the UN secretary-general - his task to nudge the two sides slowly towards a resolution, for a token salary of $1 per year. Macedonia got into the UN by agreeing to be called The Former Yugoslav Republic of Macedonia (FYROM) for all official purposes, but this was not intended to be a permanent solution to the problem, and created a new set of difficulties. "It makes for very awkward sentence construction," Nimetz says, with some understatement. Ban Ki-moon, the former UN secretary-general, once got muddled and called the country the "Former Yugoslav Republic of Yugoslavia" by accident. "He said to me, 'You've got to solve this problem. It's driving me crazy,'" Nimetz says. Despite the glacial pace of negotiations, he has never seriously thought of quitting. "Some people think it's me just sitting there thinking of adjectives to put in front of the name Macedonia - like New Macedonia, Upper Macedonia - but this issue has historical importance… importance in terms of nation-building," he says. "And it is never boring, the cast of characters dealing with it changes all the time. Think of a theatre director who does King Lear or Hamlet, but with different staging and actors. Do they get bored?" When Nimetz first became Clinton's envoy, back in the 1990s, it looked as though the dispute could spiral out of control. Greece had been objecting to Macedonia's name since 1991, when Macedonia declared independence from Yugoslavia. The following year, a million Greeks - a 10th of the population - took to the streets of Thessaloniki to protest. Those protests helped bring down the country's prime minister, and his replacement, Andreas Papandreou, barred Macedonia's access to Greek ports. Macedonia was a "real and present danger to Greece", he claimed. Nimetz has a surprising amount of understanding for the Greek fear that Macedonians could one day lay claim to Greek territory. "I have to explain to people this Greek concern about irredentism is not just created out of thin air," he says. "Within the last three generations, these sorts of threats were real to the country. This feeling that 'We're always being encircled.' In the Balkans, each country has a history of being dismembered, or having fought off their neighbours at some point." He once explained the dispute to US senators by asking how they would feel if Mexico changed its name to The Republic of Mexico and Texas, then started publishing historic maps implying ownership of the whole south-west US. However, he has equal understanding for the Macedonians. "When the Greeks say to them, 'Oh, you only came here in the 9th, 10th Century - you're not really from this region. You should call yourselves, at the most, New Macedonia,' well, to the people of The Former Yugoslav Republic of Macedonia, that's a problem. They don't consider themselves 'new'. They consider themselves indigenous as anyone." Despite this, Nimetz did at first think there would be a quick end to the dispute. So did leading Macedonian politicians. "I talked about it with them and they said, 'Time is in our favour. Let's just talk a few years, let things calm down, change some people in government.' But it didn't quite work that way," he says. A long list of names has been suggested: everything from New Macedonia and Nova Makedonija, to Slavo-Macedonia and the Republic of Skopje. At one point, both the Upper Republic of Macedonia and the Republic of Upper Macedonia were on the table. But none has yet been accepted. 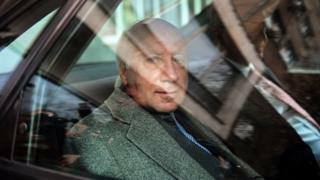 It may seem as though there are no more adjectives left to try - or any point trying them - but Nimetz insists disputes get solved when the timing is right. Just look at Northern Ireland or the reunification of Germany, he says. Change may occur because events make people look at an issue in a new light, or new leaders may come in with the political authority to take tough decisions. Or people may just get exhausted by never-ending debate. He is optimistic that the timing may be right for this dispute soon. This is partly due to new leadership in Macedonia - the Social Democrat Zoran Zaev became prime minister this year, breaking a long political deadlock in the country. But also because Macedonia needs to find a solution so it can get closer to its goals of joining Nato and the EU. "Doing that would give them reassurance, legitimacy, economic opportunities… and a sense of permanence," Nimetz says. It also might ease tensions in the country between ethnic Macedonians and Albanians, who make up a quarter of the population. In 2001, such tensions brought the country to the brink of civil war. But Nimetz admits convincing voters in both countries will be difficult. Macedonian leaders have promised any agreement will go to a referendum. He thinks part of the way out is to encourage people not to see this as a question of national identity. "I told him his concern is understandable, but it's the wrong way to look at this. We are only talking about the formulation of the name of this state for diplomatic purposes. It won't impact the average person. "We're not negotiating identity. If we were, I'd be out of here." He does recognise that identity is important, though - despite being "a great believer in globalism". "I believe there's a tribal aspect to us as a species," he says, "and it's very hard to feel comfortable in a global world, even for people like me." In all his time working on the dispute, there has been only one moment when Nimetz united both sides. It was at an unlikely time too, when Macedonia was putting up numerous statues of Alexander the Great in its cities, and had named its main airport after him, causing outrage in Greece. Image caption Skopje's airport is named after Alexander the Great, while Thessaloniki's (above) is called "Macedonia"
"When that was happening, I said to a reporter from Skopje, 'I can't understand all this, because Alexander the Great was a great military leader, but he destroyed so much and killed so many people.' Well, I got hell for that - from all sides. I almost resigned." Nimetz has just finished his latest round of meetings on the issue, meeting politicians in Skopje, and Greece's foreign minister. A solution can be achieved, he insists, but for the immediate future he is busy simply planning a holiday "up above the Arctic Circle to a lodge where the caribou migrate". A good chance to get away from questions about national identity and self-determination, surely? "Well, actually," he says, "Maybe not, when you think about the First Nations of Canada…"
He then starts enthusiastically explaining Canada's debate about indigenous self-government, and it quickly becomes clear that his love of such questions is the real reason he has been able to work on a dispute about just one word for the past 23 years.